Plenty of options, Build and looks are really nice, Touch Screen remote learns other remotes, two Sub outs, Pre all channels. THX Certified. Auto Signal Selection for movie audio. Outstanding receiver. 160x7 @ 6 Ohms It’s got the power needed for HT in a 20x20 room with ease. It’s built like a tank. Just shy of 65 LBS. I run Cerwin Vega VS 100 for mains. A Mirage OM-C3 for Center Polk Audio R-15’s for surrounds. The Sub section includes a Samson F800 Pro Amp pushing dual 10” MTX Thunder 7000 single coil subs. 400 per sub. It surprises anyone who watches movies with us. It hits hard, the highs are crisp and clear, and the mids blend. Two channel mode is satisfying as well. But for me, for two channel, I shut this one down and move to my McIntosh Mac1700. Weakness? Apparently there were a few that required main board rebuilds. I found one that did, bought it, had it rebuilt and have never looked back. They’re well worth fixing for the right price if they come with the remotes. Remote is required for the MCACC feature. I’ve owned mine for 2 years and it’s ran consistently 8 or more hours daily since rebuild. The amp section is no slouch by any means. There was never any sound output. The unit seemed to function and go through everything properly, but I saw that these specific units have issues with sound output over the years. I "took a sledgehammer" to this unit and went and bought the 47 TX and am very happy with this unit. No issues whatsoever with the 47TX and its seems like its the exact same receiver?! But funny if you look Pioneer Charged about a grand more for the 49 TXi, and all that was included on that was some I-Link?! Avoid this unit at all costs, its a problem. 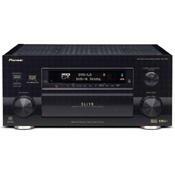 And Pioneer calls this a flagship receiver, shame on you pioneer for making 1st class garbage. I wouldnt pay 20$ for this POS. I saw the other day someone was selling a 49 TXi on Ebay for 780$ LOL LOL! I guess he's just waiting for a sucker to come buy the broken garbage unit. Heck you can go into a goodwill and find these for 20$ with no sound. If you find a remote for it (touchpad) hang onto it. Someday those will be obsolete and worth hundreds. Plus you can use the touchpad on the 47 TX. If you want good advice and want a 49 TXi, take my advice and get a 47 TX. They are much better and 100% more reliable. Simply a wonderful sounding receiver. I am running it with Cambridge Soundworks Newton T500, MC150 and M60's and it is great. The i.Link setup is a little complicated if you are using an i.Link product with it, and this is not made clear in the manual. Everything in one piece, not "colored" sound, great i-link feature, MCACC is superior in comparison to any other receiver from competitors. I absolutely don't agree with review no.1 - I use this receiver with 4 Ohm M&K THX 150 system (the original sub exchanged to 350MkII) and surround speakers are in tripole mode (impedance goes down to 2.6 Ohm)... it never shuts down even at the highest power ... that should be the problem of Bose speakers! I've found the info in internet that http://www.whatvideotv.com/testbench/index.html it can produce 235 W at 4 Ohm ... continious power! (AX10 (European version, VSA - amplifier, VSX-receiver)=49TX - output to speakers the same as 49TXi) This receiver is a real gem for me. Good looks, lots of features. Amp not high current. At this price bracket it should be. For the price, I thought I was getting everything. Of course, if you use this unit as a preamp, you do; lots of flexibility. However, the amplifier is not high current, therefore if speaker impendance drops at anytime below 6 ohms you have a problems, the unit shuts down. I have Bose speakers which are mostly rated at 6 ohms and if I use the 49TXi at high levels for an extended period of time (more than 10 minutes) it shuts down. I had the Onkyo 989 before and never had this problem, the Onkyo's amp is High Current. I'm thinking about returning this unit, unless I buy a good external amplifier or higher impendance speakers and I'm not willing to go for the extra expense. Practically everything so far. Especially if compared to its competition for price. A second component output would have been nice. Otherwise, too bad it doesn't mix and serve drinks during the performance. This is my first AV-Receiver but I've been an audio-freak for 15 years so I know what to look for in any hifi-related component.